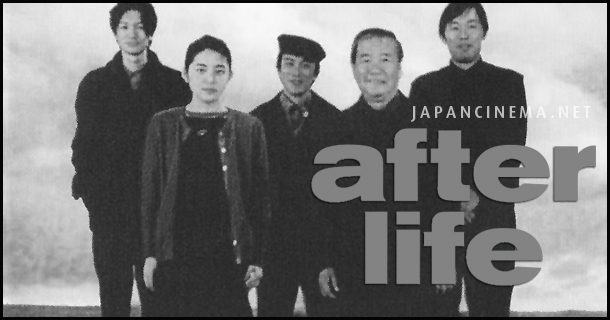 Kore-eda Hirokazu’s After Life is a compelling film. It begins with the premise that when we die we go to a facility for a week where the staff helps us select a single memory with which we will live for all eternity. Once we choose, the staff stages and films a representation of that moment using improvised sets and actors. Then at the end of the week, we watch the film recreation on screen and when it is over we simply disappear, to live with that memory forever. Those who are unable (or unwilling) to choose a memory stay on as facility staff to help others until they too make a decision. It makes sense that a film about filming life is visually fascinating. The main narrative portions of the film were photographed in 16mm by documentary cinematographer Yamazaki Yutaka, while still photographer Sukita Masayoshi filmed the memory sequences using unique combinations of black and white, color, and very grainy 8mm film. After Life juxtaposes different visual styles. In some scenes there are establishing shots and long takes (“pillow shots”) that are almost photographic, and the film is full of pauses and lingering moments that give us time to reflect just like the characters are doing. During interviews with the deceased Kore-eda employs a fixed documentary camera, while during many scenes we follow the caseworkers through the unsteady lens of a handheld camera. Kore-eda slowly reveals the film’s mysteries for us. Gradually we learn that everyone is dead, that the caseworkers refused to choose a memory, and that they have their own stories, longings, and regrets. The ordinariness of it all is striking. We see fairly typical Japanese office behavior unfolding in a cold, dusty, shabby, dreary office building. But with great skill Kore-era makes the ordinary utterly fascinating. After Life refuses to indulge in comfortable clichés about memory, even when the staff members try to prompt new arrivals to focus on clichéd moments. Saccharine shortcuts just won’t do. Memories, it turns out, are not primarily visual experiences. They are not replicas of what took place through the eyes of an earlier self. Memories are emotional states that only become manifest through the act of talking about them. Different cues help reproduce these past experiences in the present: weather, food, smells, objects, and especially sounds. As viewers we first rebel against what seem to be hopelessly inadequate stage sets when the staff films each person’s memory. How could people possibly mistake these recreations for the real thing? But that is part of Kore-eda’s point, I think. The film set is simply a springboard to a remembered emotional state. After Life works against the idea that a faithful memory is an exact replica of what we remember seeing in other ways as well. The film is a showcase for “obsolete” technology. The offices have old rotary phones, piles of books, and no computers. The film technology that records memories is videotapes, and caseworkers can order stacks of grainy VCR tapes that contain imperfectly captured past experiences. Kore-eda seems to be saying that technological wizardry cannot reproduce life as it was, and that in our quest for visual perfection we may have focused too much on verisimilitude and not enough on the emotional content of our lives. After Life is a superb and absorbing film. Posted on January 30, 2014 by bilcummings. 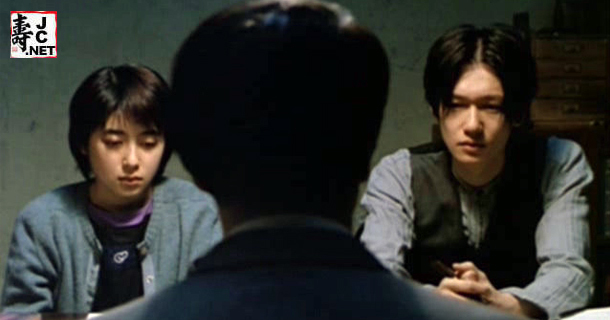 This entry was tagged After Life, asia, cinema, death, film, Hirokazu, japan, Kore-eda, Koreeda, memory, review, technology. Bookmark the permalink.